Salvation is free to us, it is a gift we don’t deserve, never could and never will deserve, but still is given and extended through the sacrifice of Jesus Christ on the Cross from the Father. We are saved when we accept this gift, when we confess with our mouth that Jesus Christ is Lord, because we believe that God raised Him from the dead and with this confession, we are saved! We DO have to accept salvation as the gift from God. (A gift IS a gift when the receiver accepts it). However the LOVE the Father has for us is not contingent on whether we accept it or not or whether we believe it or not or whether we feel it or not or whether we reciprocate it or not; God loves us anyway, all the time, anytime and always. 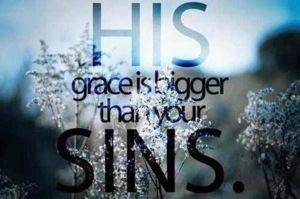 That is why His gift of salvation is free to us, because He LOVES us so much and His grace is undeserving by us. The very same grace that saved us from judgment and saved our soul, is helping us to become transformed into the likeness of Christ in the renewing of our minds daily. His grace shows up in our weaknesses, in our failures and is always enough, always sufficient for us everyday, every hour, every minute and every moment. We can do all things necessary through Christ Who strengthens us only because of His grace! Because we walk moment by moment in the grace Father has given us, we can be gracious to someone else. We can choose to forgive and let go of the anger, bitterness and resentment we have toward someone that has hurt us. We may have a reason and a right to hold the grudge, BUT Father says, “LET IT GO!” Freely we have been given grace and He forgave us, He desires for us to extend grace, forgiving those that hurt and betrayed us. There is such freedom in our lives when we choose to walk in forgiveness. May the true revelation of Fathers unfailing, never ending love for you be made so real to you today and may you know His grace is enough to sustain and enable and equip you to be loving, kind, forgiving and compassionate to those you come in contact with. His love is amazing, His grace is amazing and you my friends are amazing as He resides in you! Make this a wonderful day and purpose in your heart, in your thoughts and thereby in your actions to be a blessing to someone and you will have a very blessed week ahead!